Fiedler’s Contingency Theory of Leadership states that your effectiveness as a leader is determined by how well your leadership style matches the situation. Fiedler’s Contingency Theory isn’t the only contingency theory. Contingency theory is a general theory which says that there is no one singular best way to structure your organization and lead your team. Instead, the best way to do this will be contingent on the situation. So, contingency theories examine how best to run your team or organization given different situations. Another way to say this is that the best leadership style will be contingent on the situation. 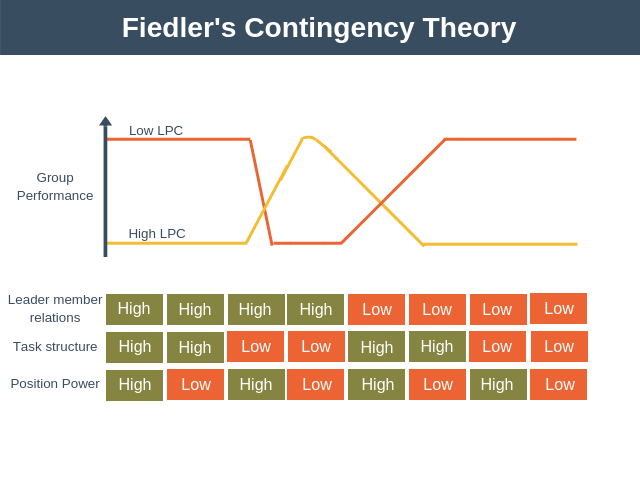 Fiedler’s Contingency Theory, just like all contingency theories, states that there is no one best way to lead your team. The best way to lead your team will instead be determined by the situation. It is important to realize that in Fiedler’s Contingency Theory your leadership style is fixed. You cannot change your style to suit the situation. Instead, you must put leaders into situations that match their style. This puts the theory at odds with more modern contingency theories such as situational leadership. There are two important factors in Fiedler’s Contingency Theory: leadership style and situational favorableness. The first step in using the model is to determine your natural leadership style. To do this, Fiedler developed a scale called Leased Preferred Coworker (LPC). To score yourself on this scale you have to describe the coworker with whom you least prefer to work. What do you think about those people you least prefer working with? High LPC = Relationship-oriented leader. Low LPC = Task-oriented leader. Task-oriented leaders tend to be good at organizing teams and projects and gettings things done. Relationship-oriented leaders tend to be good at building good relationships and managing conflict to get things done. The next step is to understand the favorableness of the situation you face. This is determined by how much control over the situation you have as a leader (situational control). This factor measures how much your team trusts you. Greater trust increases the favorableness of the situation and less trust reduces it. This factor measures the tasks that need to be performed. Are they clear and precise or vague? Vague tasks decrease the favorableness of the situation and concrete and clear tasks increase it. This is determined by your authority, meaning the power you have to reward or punish your subordinates. As you might expect, having more power increases the situational favorableness. To use Fiedler’s Contingency Theory of Leadership follow these steps. The first step is to determine your preferred leadership style using the LPC scale. You can use the following table to score yourself on the LPC scale. Fill in your answers keeping in mind the one person that you least like to work with. 73 and above: You are a relationship-oriented leader. 54 and below: You are a task-oriented leader. Between 55 and 72: You are a mixture of both and it’s up to you to determine which style suits you the best. Is trust with your team high or low (member relations)? Are tasks vague or clear-cut and well understood (task structure)? Is your authority low or high (position power)? The easiest way to do this is to score each answer from 1 to 10, with 10 representing the highest value. Now that we understand how we like to lead, and we understand the situation we are facing, we’re in a position to determine if we have the right style for the situation we’re facing. This table is showing us what Fiedler found to be the best leadership style given different combinations of the situational factors. In general, you can see that when situations are highly favorable or highly unfavorable the task-oriented leader is most effective. It is only in the middle area, where situational factors are mixed, that the relationship-oriented leader is most effective. From Fiedler’s perspective, you would place leaders into situations that are most suited to their style. However, a more modern approach is to adapt your style according to the situation. Trust will be low. This is because you are new to the job so your team won’t trust you. Secondly, staff turnover is high so it’s going to be difficult to build strong relationships. Task structure is high. This is because there are extremely clear operating procedures to follow covering everything from how to make each pizza, to how to welcome customers to the restaurant. Position power is high. You have the ability to hire and fire and reward and punish as is required. According to Fiedler’s Contingency Theory of Leadership, and using our table above, a relationship-oriented leader is best suited to this type of role. In this example, we’re going to imagine that you’ve just been promoted to be the manager of a software development team you’ve been working in for two years. Trust will be high. You’ve already worked with the team for two years, know each of the team members well, and they trust you. Task structure is high. Even though software development is complex, task structure is high as the team knows what they have to do each week. Position power is low. Although you’ve been promoted to manage the team’s day to day work, you are not responsible for line managing any of them. Thus, you don’t hold much formal authority over any of them. According to Fiedler’s Contingency Theory of Leadership, and using our table above, a task-oriented leader is best suited to this type of role. It provides a simple rule of thumb for identifying which leaders are best for which situations. Unlike many other leadership theories, it takes the situation into account in determining the effectiveness of a leader. Both the LPC and the situational factors are easy to measure. It’s not flexible at all. If your leadership style doesn’t match the situation that’s it. Game over. You need to be replaced. There is nothing you can do to change the situation. 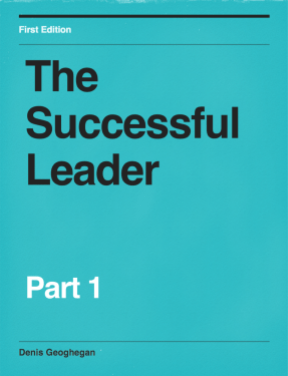 The LPC scale is subjective and so its possible incorrectly assess your own leadership style. If you happen to fall in the middle of the LPC scale then there is no guidance as to which kind of leader you might be. Your assessment of the situation is subjective. This means you may incorrectly assess the situation and consequently, you may incorrectly determine what kind of leader is required. The theory is based on the premise that each of us has one and only one leadership style which can be scored on the Least Preferred Co-worker (LPC) scale. Using this LPC scale you are either a relationship-oriented leader or a task-oriented leader. According to Fiedler, task-oriented leaders get the best results when faced with strongly favorable or strongly unfavorable situations. In situations of mixed favorableness then relationship-oriented leaders get the best results.